In the previous blog post (DBT Basics), I was able to explain the very basics of DBT. 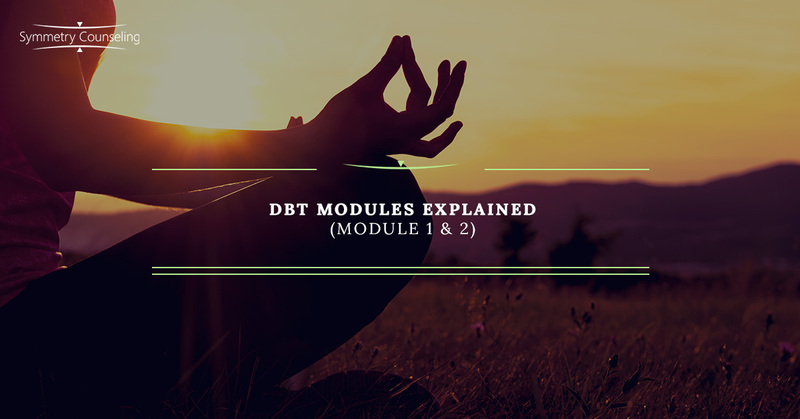 In this post, you will get a better understanding of 2 of the 4 modules that are used when working with individuals or groups in a DBT scope. Dialectical Behavioral Therapy, also known as DBT, was founded by Marsha Linehan, who is currently still teaching at the University of Washington-Seattle. There is the Linehan Institution which offers DBT intensive training. When DBT was first identified in the 1990s, it was originally known to help individuals with Borderline Personality Disorder (BPD), but now DBT is useful for all individuals with all disorders. DBT can be really helpful with individuals that suffer from depression, anxiety, eating disorders, substance abuse, and relationship issues. There are four modules: Core Mindfulness Skills, Interpersonal Effectiveness Skills, Distress Tolerance Skills, and Emotion Regulation Skills. Core Mindfulness and Interpersonal Effectiveness Skills will be discussed further in this post. Core mindfulness deals with the thinking and our mind that we use daily. When looking at the dictionary definition of “mindfulness,” most will say it is the quality or state of being conscious or aware of something. DBT states that mindfulness helps individuals explore the present moment, rather than focusing on painful experiences from the past or what the future might hold. It allows us to obtain tools to help individuals not be judgmental about themselves or others. Sometimes individuals have difficulty with living in the moment and tend to run away from what is actually at hand. This module allows individuals to live in the moment and to overcome anxieties that they might be dealing with. The past and future are big aspects, of which the past is a function of memory and the future is a projection of the past on the future. This means to most that our past is just a memory and we use those memories to allow us to know and believe what the future might hold (routines). It can be difficult to live in the moment, but DBT really teaches individuals how to be present with what is at hand and not to worry about the past or the future. 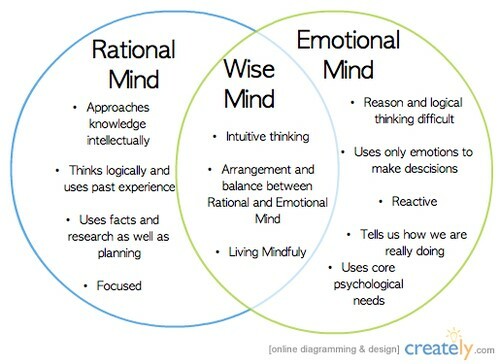 There are three types of “minds” that DBT teaches us to use and to find an equal balance between them. Rational Mind is a more intellectual way, which allows us to think logically and use facts that we know. Emotional Mind is when reasoning and thinking logically are difficult, and individuals are reactive and only utilize emotions to make decisions. The middle mind is the Wise Mind in which is the most effective “mind.” It is a combination of the Rational and Emotional mind. Mindfulness is also the main way to balancing our minds and to achieve thinking in a positive way. “What” skills include observing, describing, and participating, while “How” skills include being non-judgmental, one-mindfully, and effectively. Meditation can also be a big help with mindfulness which includes deep breathing and adult coloring books. Interpersonal Effectiveness Skills deal with the relationships that they have in their lives. This allows them to obtain tools that will help them express their beliefs and needs, set limits, and negotiate solutions to problems. This can all be done while protecting relationships that they are in while also treating others with respect. The goal of this module would be to obtaining changes that one wants, maintaining relationships, and maintaining your self-respect. Objective Effectiveness means being able to get what you want from the situation; to obtain the goals you want in the relationship and to have your wishes taken seriously. Relationship Effectiveness is keeping and improving the relationship. If you are able to improve interpersonal relationships, you will get what you want, and others will respect you even more than before. Self-Respect Effectiveness is keeping and improving self-respect. It includes maintaining and improving your own feelings about yourself and believing in your own values.